Feel Like Royalty with the Stressless Crown Medium Recliner and Ottoman- Classic Base. Now is a terrific time to save on a Stressless Recliner and Ottoman. Choose your favorite fabric type or leather grade, choose your favorite color and then consider matching it perfectly with an amazing accessory. Consider these highly productive accessories: The simple Swing Table, the ultra-convenient Personal/Laptop Table, the useful Ellipse Table, the stylish Urban Table, or the fan-favorite Elevator Ring set. The standard pricing is automatically reflected when you make your leather/fabric selection from the colored swatches above. Need assistance- Please call 1-888-486-9463. Enjoy Fast & Safe Delivery on a Stressless Crown Medium Recliner with Ottoman. Start relaxing in your beautiful new Crown Medium Recliner sooner with our Quick and Easy Shipping Methods. It's a great time of year to purchase from the amazingly comfortable, Stressless Crown Medium Series! This popular, modern recliner delivers exquisite head, neck and back support and the over-stuffed smooth, soft, cushioning allows you to sit undeterred for many hours on end. The Stressless Crown Medium recliner is among the most modern Stressless recliners available. Make your preferred leather or fabric type and color by using the pull down menu above, which is titled: "Select Leather or Fabric Type or Color". Sectionals, Sofas, Office Chairs: They Look and Feel Like Ekornes Stressless Recliners - because they are Stressless Recliners. If you see the Blue Logo, you know you are getting into one of the most comfortable seating options available today. Experience full-body comfort at work or in your home or office. 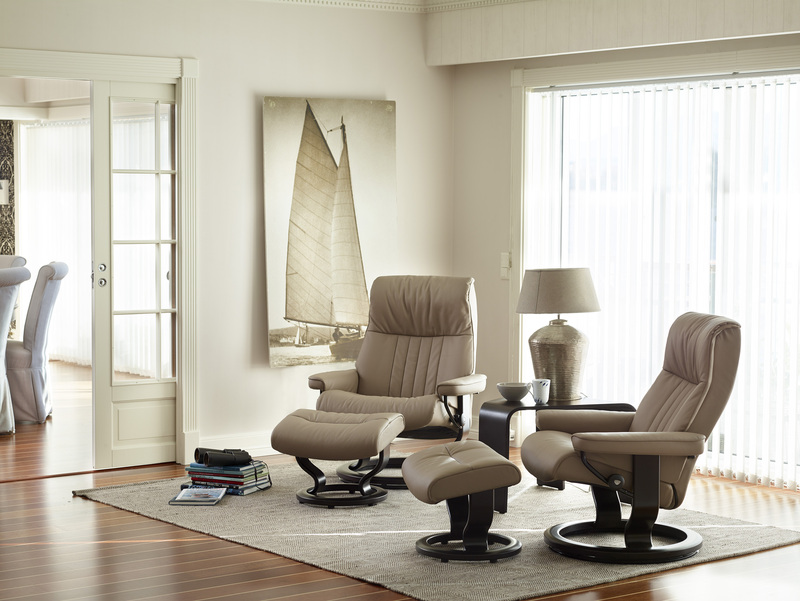 Ekornes has taken ultimate comfort to a new arena, so that you can enjoy real Stressless comfort while working. We have tons of new Ekornes Furniture in stock for fast, stress-free nationwide delivery! Stressless Office Chairs & Recliners arrive fully-assembled with Full Manufacturer's Warranty and our Money Back Guarantee. Choose Pain-free Nationwide In-Home/Office White-Glove Delivery - Select White-Glove Delivery when you order your back-saving Stressless Furniture from Unwind.com and we'll bring your chair inside and even set it up (we'll even take the packaging when we leave). Call 1-888-486-9463, click or email stressless@unwind.com to connect with a Stressless Furniture Specialist. Whether it's Large or the Medium Sized Version, this model has been called "...a royal success...". The ingenuity of the Stressless Crown is that the Medium Version sits those perfectly that have trouble deciding whether they need a Small Sized Seat or a Medium Sized Seat. However, for those who know that they sit a Large Model most comfortably, the Large Crown Recliner is designed to take you to a brand-new kingdom of comfort. We translate this to mean- "...The pronounced head support and striated comfort zones for the lower/middle spinal region provides support to parts of the body that desperately seek a sanctuary from the stresses and strains of everyday life." Our fast Nationwide White Glove Service means that we will bring your recliner, office chair, sofa or sectional into your home (or office), unpack it, set it up and take the box/packaging with us when we leave. Of course your furniture will arrive fully-assembled and ready to enjoy! The Stimulating Stressless Crown Recliner and Ottoman- will be an Ekornes Best Seller. Choose fast Inside Residential or White Glove Delivery. The numerous divisions/seams on this recliner make it unique in its seating support. Our customers say that they feel "total support... An overall feeling of plush padding...". The perpendicular seaming allows the padding to be evenly distributed throughout your lower back to mid-level back to shoulders. This provides you with a "surrounding" experience of comfort and padding. This is just one more reason why the Crown is one of the best-selling Stressless Recliners. It is a medium-sized seat which accomodates a large percentage of users. Soft contours with near perfect lumbar and neck support, make the Crown recliner a Stressless best seller worldwide. Its comfy, intuitive design hides the advanced ergonomics which can help your back, body and mind relax and feel years younger! Are you interested in the Stressless Sofas to pair with this Crown Recliner? Follow these links for some popular models: [Buckingham Sofa - Large Size Sofa] or [Windsor Sofa - Medium Size Sofa]. Not only are the sofas beautifully designed themselves but they harmonize flawlessly with the chairs. They also feature independent, individually reclining seats. Often times, there are special colors that are available at 20% of the regular pricing for these models. Check out our Sofa Specials Page, to learn more. We frequently see customers selecting the Paloma leather colors for this and other similar models. This allows you to have the awe-inspiring, patented Stressless technologies, with an extremely soft leather. The Paloma Leather option is available at a middle-range price for Stressless Recliners. Each leather and fabric selected and manufactured by Ekornes has its own unique merits. Check out our informational pages here: [Leathers from Ekornes] and [Fabrics by Ekornes]. 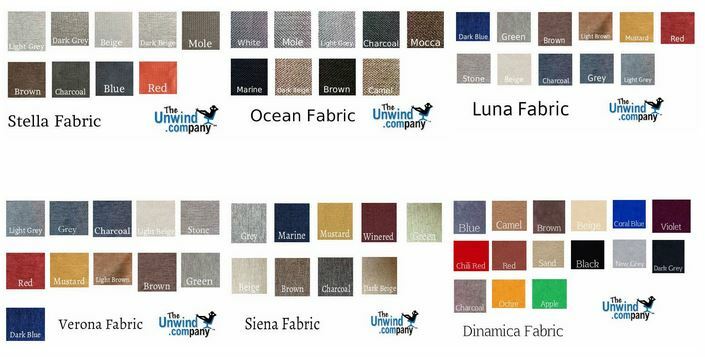 There are currently 6 different fabric grades for you to choose from with each having unique color opportunities. Our customers and friends that prefer fabrics to leather prefer how some of the fabrics have a coarse traditional weave. Others enjoy the Chenille styling of the Luna Fabric. There are so many textures and colors available to you that it's practically guaranteed you will find something to suit your needs. Want to see informative Ekornes Stressless Crown videos? Visit our Ekornes Stressless Crown video channel on YouTube. Come visit the Unwind Back & Body Store to experience the Ekornes Stressless Crown for yourself. If you have already decided and are ready to purchase, simply click the "Add To Cart" button after selecting from the available options. Please review our return policy prior to ordering or call 888-486-9463 for personal assistance. You may also email your orders and requests to stressless@unwind.com anytime- 24 hours a day- 7 days a week. Checkout our huge selection of in-stock, extremely fast-shipping recliner choices by dropping us line Monday-Saturday until 5pm CST. We have tons of Ekornes Special Order Models ready to ship out within 1 day of ordering! We will have many Stressless Crown recliners in stock (see above) in multiple locations which allows us the ability to ship your recliner extremely fast and have it delivered quickly from coast to coast. The Unwind Company currently offers same-day delivery on in-stock items to almost 70 cities across the United States. Due to the time-sensitivity of our Unwind Express Delivery Service, we are currently unable to process these orders online. Please call 1-888-486-9463 and you can be enjoying your Stressless recliner much faster than you ever imagined. Of course there are some restrictions on this service and sadly, it is not available everywhere. -Stressless Recliners are created for a custom fit- Many of the Stressless recliners come in three sizes (small, medium or large) and many sofas are available in two sizes (medium or large). The Stressless Crown Recliner (medium) is comparable to the medium versions of the other Stressless recliner lines (Stressless Reno, Stressless Wing etc). 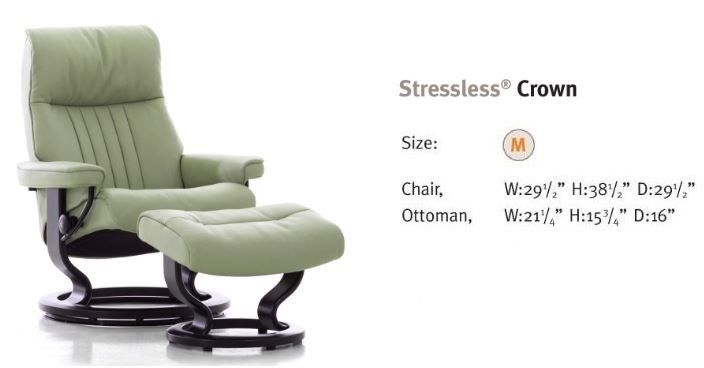 The Stressless Crown Recliners (medium and large) share the same attributes. For best results, take a seat and let us help you determine which size will ultimately offer the most comfort and correct support for your individual body size and weight. It's no wonder that Stressless Crown Recliners are Exclusively Endorsed by the American Chiropractic Association (the ACA). The Unwind Company consistently maintains a flawless A+ Rating with the Better Business Bureau, with millions served. May we assist you as well? We'll always do our very best to get you taken care of- We guarantee it! Not only does Ekornes stand by their products but we stand by our customers and friends. Give us a call at 888-486-9463 and ask what sets up apart from the rest. Have questions or need additional information about the Crown or other Stressless Recliners from Ekornes? Please drop us a message at stressless@unwind.com or give us a quick call at 1-888-4-UNWIND (888-486-9463). We're here to assist you with your Stressless Furniture or other Soothing Back Product purchase.